What are elephants’ tusks made of? An elephant’s tusks are really two overgrown teeth. The elephant’s tusks are really teeth that are too long to fit its mouth. They are made out of a hard, tooth like material known as ivory. The African elephants grow the biggest tusks of all. Many tusks are taller than a tall man and may weigh 80 pounds each. Elephants use their tusks as tools to dig up roots to eat and for fighting. With them, they can also fit and carry heavy loads weighing as much as a ton. Young elephants grow small baby tusks called milk tusks, which are never more than two inches long, and shed them by the time they are two years old. 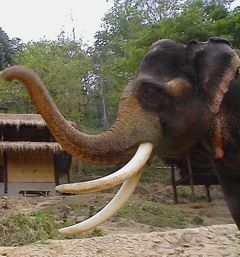 Then the permanent tusks grow in and continue to grow as long as the elephant lives. How do opossums rear their young? Newborn opossums are reared in a pouch on the mother’s stomach, when they are old enough to leave the pouch. The mother carries them on her back. Opossums are furry animals that look something like an overgrown rat. 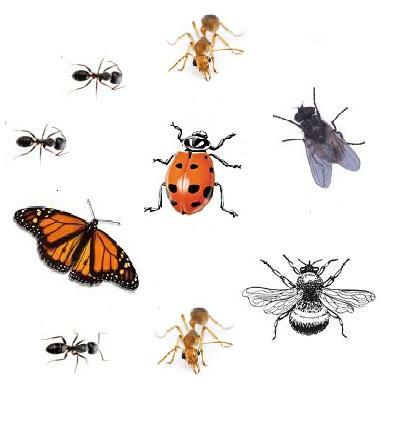 They can be found living in many parts of North America. The way in which the opossum rears its young sets it apart from all other American animals. 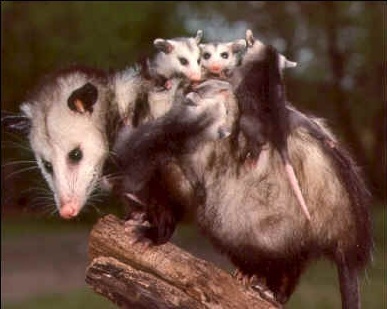 Opossums are marsupials – that is, a baby opossum grows up in a pouch on its mother’s stomach, like a baby kangaroo. Baby opossums are tiny and helpless when they are born. Four to 18 babies may be born at one time. Each baby is no longer than your thumbnail. The babies at once crawl into the mother’s pouch. The babies stay safe and snug in the pouch , feeding on the mother’s milk until they are big enough to live outside the pouch. After they leave the pouch, the baby opossums ride around on the mother’s back until they are old enough to take care of themselves.